Posted on December 15th, 2009 , under News, Winter projections. We recently published a knol in PLoS Currents Influenza about the estimate of the demand for critical care and antibiotic usage due to the Fall 2009 wave of pandemic Influenza H1N1. D Balcan, V Colizza, AC Singer, C Chouaid, H Hu, B Gonçalves, P Bajardi, C Poletto, JJ Ramasco, N Perra, M Tizzoni, D Paolotti, W Van den Broeck, A-J Valleron and A Vespignani. PLoS Currents: Influenza. 2009 Dec 4, RRN1133. The most common symptoms of influenza are generally mild for the majority of people infected. However, in a small portion of clinical cases infected with influenza, the disease can lead to complications of increasing severity requiring medical attention, antibiotics, and, in more serious situations, hospitalization and intensive care. Given the limited capacity of health care providers and hospitals and the limited supplies of antibiotics, it is important to predict the potential demand on critical care to assist planning for the management of resources and plan for additional stockpiling. In the knol, we introduce a model that considers the development of influenza-associated complications and incorporate it into a GLEaM to assess the expected surge in critical care demands due to viral and bacterial pneumonia. More specifically, the new compartmentalization adds to the basic structure of the influenza dynamics a set of compartments and transitions taking into account the possible evolution of the complications associated to an influenza infection, including viral and bacterial pneumonia, and different speed of progression and stages of severity of the disease. It includes home treatment, hospitalizations, and admission to intensive care unit (ICU). Patients in each stage of pneumonia complications are assumed to be treated with antibiotics, with a preferred empirical antibiotic regimens based on the guidelines issued by the British Thoracic Society. 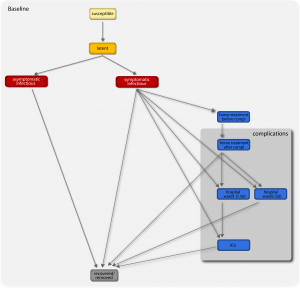 A sketch of the complete compartmental model can be seen in the figure below (click on the left panel to zoom in). Time evolution of the ICU occupancy in a set of countries, measured as the predicted need of ICU beds per 100,000 persons. Based on the most recent estimates of complication rates, we predict the expected peak number of intensive care unit beds and the stockpile of antibiotic courses needed for the current pandemic wave. The effects of dynamic vaccination campaigns (see this post), and of different length of staying in the intensive care unit are also explored. The right panel of the figure (click on it to expand it) shows the predicted ICU occupancy as a function of time for four countries of the Northern Hemisphere. The three profiles per each country refer to the predicted ICU occupancy in the baseline case when no intervention is implemented, and in case dynamic vaccination campaigns with distribution rates rv=0.1% and rv=1% are considered. Solid curves correspond to the median profiles and the shaded areas to the 95% reference range obtained from 2,000 stochastic simulations. The average ICU length of staying is assumed equal to 7 days. Tables 1 displays further details on these ICU predictions for a baseline situation and when a vaccination campaign with distribution rates rv=0.1% is considered. The predicted need of ICU beds at peak are typically moderate even when the baseline scenario without intervention is considered, ranging approximately from 5 to 7 ICU beds per 100 000 inhabitants, well below the average national capacity of ICU beds per 100,000 inhabitants. Such numbers can be reduced if measures as vaccination campaigns are taken into account. Table 1: Predicted need of ICU beds in a scenario with a vaccination campaign covering 0.1% of the population per day until end of vaccine stockpile. The 95% reference range (RR) of the daily number of occupied ICU beds per 100,000 is reported at its peak for several countries in the Northern Hemisphere. Table 2 reports the number of antibiotics courses needed daily at the peak of the requests, and the total size predicted to be used at the end of the pandemic wave, based on the empirical guidelines of the British Thoracic Society and broken down by the stage of severity of pneumonia. A single course of antibiotics is defined as the combination of antimicrobial drugs considered in the treatment regimen for the suggested duration (see the knol for additional details). The total size of antibiotics courses predicted to be used in the current Fall 2009 pandemic is in the range of [6,337-7,149] per 100,000 for the set of countries explored, which needs to be compared with the available stockpiles of antibiotics courses to cover high-risk groups. Many countries however do not possess nation-wide antibiotic supplies, as antibiotics are generally available through short supply chains able to fulfill average just-in-time requests. The estimates contained in Table 2 can therefore be considered as guidelines to assess the expected needs during the remaining evolution of the pandemic wave with respect to the present usage pattern and available resources. Table 2: Predicted usage pattern of antibiotics in the scenario with the previous vaccination campaign. The 95% RR of the daily number of administered antibiotics courses per 100,000 at its peak is reported, along with the total amount predicted to be administered by the end of the pandemic wave. Results are shown for several countries in the Northern Hemisphere, broken down for different stages of influenza-associated complications. Pneumonia stages I, II and III corresponds to home-treatment (or supervised outpatient treatment), hospital wards and ICU, respectively. Posted on November 12th, 2009 , under News, Winter projections. Emerging Health Threats Journal 2009, 2:e11. 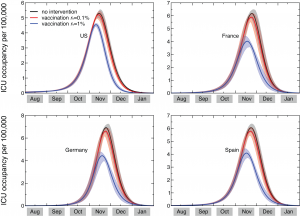 The paper discusses the effectiveness of the vaccination campaign in mitigating the epidemic in the northern hemisphere, according to the predicted epidemic unfolding. The relative reduction of the epidemic peak activity with respect to the baseline (no-interventions) scenario is measured. Mitigating effects are explored depending on the interplay between the predicted pandemic evolution and the expected delivery and distribution rate of vaccines. The incidence curves, reported below, show the impact of an incremental vaccination with 1% daily distribution starting on October 15. US and Spain are considered as examples. The model is calibrated using the latest estimates on the transmissibility of the new A(N1H1) influenza, considering as reference the late peak case (the details are reported here). The effect of the vaccination campaign is compared with a combined strategy that includes the systematic treatment of clinical cases with antiviral drugs, where different antiviral distribution rates are considered. Incidence curves for US and Spain for different intervention scenarios. The gray bar indicates the time period during which the immunization takes effect. The results show that if additional intervention strategies were not used to delay the time of pandemic peak, vaccination campaigns may not roll out before the pandemic peak is already reached. In the US it is likely that the vaccination campaign will not be able to substantially reduce the epidemic activity, vaccination however will be crucial for the protection of risk groups and healthcare workers. 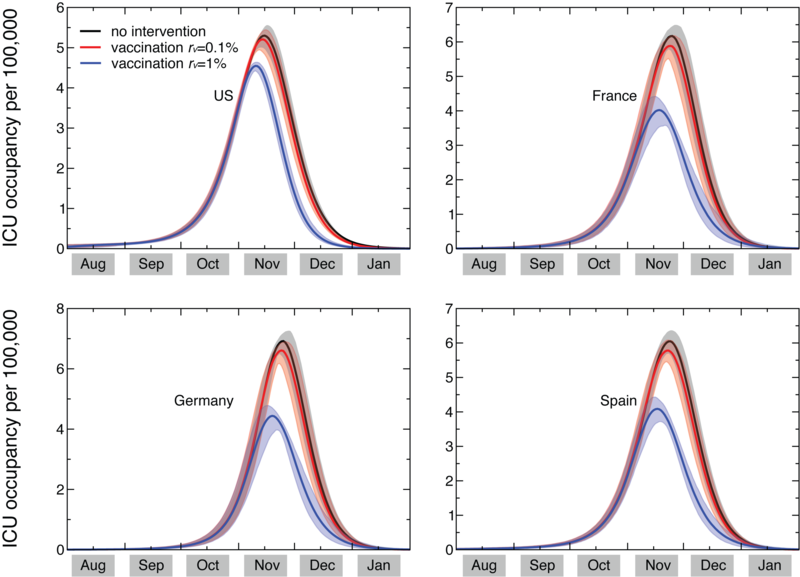 In Europe the activity peak is shifted of a few weeks and the modeling shows that timely vaccination campaigns able to cover 30% of the populations by the second half of November might be effective in mitigating the pandemic. Unfortunately reports of delays in the production and distribution of vaccine have fuelled concern that supplies will arrive too late to make a difference in the number of people that get infected with the new virus. This is again a strong rationale for the prioritized vaccine distribution programs focusing on high-risk groups, healthcare and social infrastructure workers. Posted on September 17th, 2009 , under Winter projections. The animation shows the predicted geotemporal evolution of the H1N1 flu epidemic in Europe for the next fall, comparing the no intervention scenario (left map) with a scenario in which mitigation strategies are considered (right map). Simulations for the no-intervention scenario are obtained from the maximum likelihood analysis used to estimate the transmission potential of the new influenza A(H1N1) (see this post for more details) . The antiviral treatment scenario foresees the use of antiviral drugs administered to 30% of the clinical cases within one day from the onset of symptoms. The maps display the daily new number of cases at a resolution level of ¼° with a color code ranging from yellow (low activity) to dark red (peak activity). The data mapped is obtained from the average value of the daily new number of cases calculated on 2,000 stochastic realizations of the model, for each of the two scenarios. The timeline shown is from September 1, 2009 to January 31, 2010. The plot at the bottom of the page reports the corresponding country profiles in the same time window. The shaded area corresponds to the 95% CI obtained from the simulations. Results show that the use of antiviral drugs for treatment of 30% of the cases would result in a delay of the epidemic peak of approximately 4 weeks. This delay would be extremely valuable in providing the necessary time for the implementation of the mass vaccination program. Balcan D et al, Seasonal transmission potential and activity peaks of the new influenza A(H1N1): a Monte Carlo likelihood analysis based on human mobility. BMC Medicine 2009, 7:45. Posted on September 14th, 2009 , under Winter projections. The animation shows the predicted geotemporal evolution of the H1N1 flu epidemic in the United States for the next fall, comparing the no intervention scenario (left map) with a scenario in which mitigation strategies are considered (right map). Simulations for the no intervention scenario are obtained from the maximum likelihood analysis used to estimate the transmission potential of the new influenza A(H1N1) (see this post for more details) . The antiviral treatment scenario foresees the use of antiviral drugs administered to 30% of the clinical cases within one day from the onset of symptoms. Posted on September 11th, 2009 , under Winter projections. On June 11th the World Health Organization has officially raised the phase of pandemic alert to level 6. As of July 19th, 137,232 cases of the new H1N1 influenza strain have been officially confirmed in 142 different countries. Given the wide diffusion of the virus and the large number of cases the WHO has stopped keeping track of the number of cases. Since the end of May, however, most of the countries heavily affected by the virus relaxed on a regular surveillance system that could imply an underreporting of influenza cases by a factor 5 to 30 depending on various circumstances . For instance estimates for Mexico underreporting ranges from one to almost 3 orders of magnitude . In this framework, the interest in forecast analysis and projections is shifted from the early local assessment of the epidemic evolution to long-term analysis on the activity peaks and impact of the pandemic in the future months. In order to do that one has to move to different methodological approaches able to capture elements such as the impact of seasonality on the virus transmissibility and the global spreading pattern. In the past weeks we have performed a maximum likelihood analysis on the GLEaM model parameters fitting the data of the chronology of the H1N1 epidemic. This is done by generating one million simulations on the worldwide scale of the pandemic evolution and finding the set of parameters that best fit the actual evolution of the pandemic. This has allowed us to estimate the transmission potential of the disease and the seasonality features. We model the seasonality by rescaling the R0 value in the Northern and Southern hemisphere taking into account seasonal changes. The free parameter to estimate is the value of the scaling factor during summer months, amin, representing the degree of dependence of the observed swine flu epidemic on the seasonality effects (amin=1 if no seasonality is in place). By using the seasonaility scaling, GLEaM provides an early assessment of the future unfolding of the epidemic in the different hemispheres. In the following, we report results of a worst-case scenario in which no effective containment measures are introduced. We predict a first wave of cases for countries in the Southern hemisphere that occurs between August and September in phase with the seasonal influenza pattern, and independently of the seasonality scaling factor. The situation is different in the Northern hemisphere where different seasonality parameters would progressively shift the peak of the epidemic activity in the winter months. We have analyzed the results from the model in the range of the seasonal scaling factor that best fit the pandemic evolution so far and we find the potential of an autumn/winter wave in the Northern hemisphere striking earlier than expected for seasonal influenza, with peak times starting in the second half of October. In the following table we report the activity peaks in well-defined geographical regions of the world. Activity peaks in well-defined geographical regions of the world. The interval represents the 95% Confidence Interval for the date at which the epidemic peak should be reached in different geographical areas. The peak estimate for each geographical area is obtained from the epidemic profile summing up all subpopulations belonging to the region. The activity peak estimate for each single country can be noticeably different from the overall estimate of the corresponding geographical region as more populated areas may dominate the estimate for a given area. For instance Chile has a pandemic activity peak in the interval 1 July – 6 August, one month earlier than the average peak estimate for the Lower South America geographical area it belongs to. It is also worth noting that the present analysis considers a worst-case scenario in which no effective containment measures are introduced. This is surely not the case in that pandemic plans and mitigation strategies are considered at the national and international level. The figure below shows the delay effect induced by the use of antiviral drugs for treatment with 30% case detection and drug administration. The left panel displays the peak times of the epidemic activity in the worst-case scenario (black) and in the scenario where antiviral treatment is considered (red), for a set of countries in the Northern hemisphere. The intervals correspond to the 95% confidence interval (CI) of the peak time. The right panel shows the incidence profiles for Spain and Germany in the worst-case scenario (black) and in the scenario where antiviral treatment is considered (red). An average delay of approximately 4 weeks is observed. Dealy effect induced by the use of antiviral drugs for treatment with 30% case detection and drug administration. In the next days we will post the complete results of the analysis including the scenarios for possible mitigation measures including vaccination campaigns. Graske et al., BMJ 2009, 339: b2840; Wilson N, Baker MG, Euro Surveill. 2009, 14(26): pii=19255. Fraser C et al, Science 2009, 324: 1557-1561; Cruz-Pacheco G et al, Euro Surveill. 2009, 14(26):pii=19254. Balcan D et al, Seasonal transmission potential and activity peaks of the new influenza A(H1N1): a Monte Carlo likelihood analysis based on human mobility, BMC Medicine 2009, 7:45.